These are 3 holo swatches on my left hand. They are Starrily’s “Aix-En-Provence“, F.u.n. 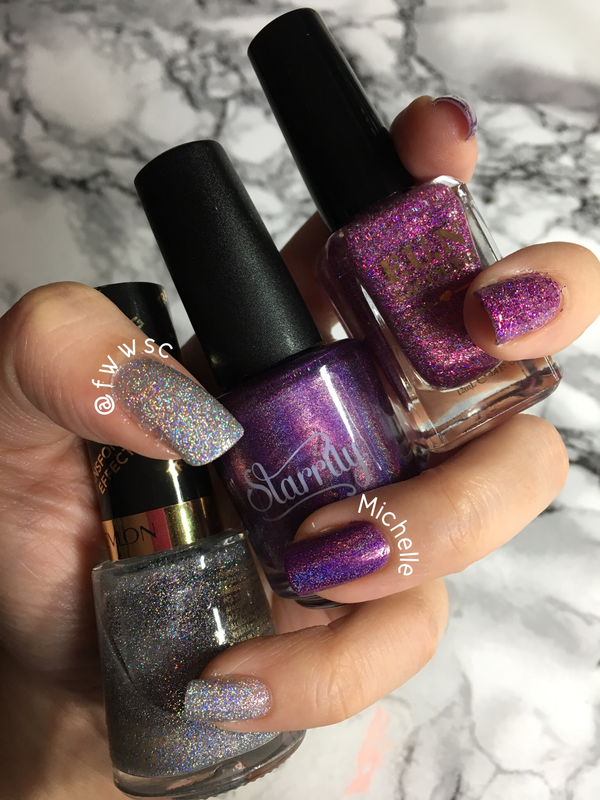 Laquer’s #SimplyNailogical collection “Holo Queen (H)” and Revlon’s Transforming Effects, “Holographic Pearls“. Right now I believe the only one sold out is the “Holo Queen (H )” and it’s part of the new Simply Nailogical collection that came out a couple of weeks ago. They both look absolutely gorgeous!!! The (H) shades simply have more holo glitter in them. Get it? Simply? No? I happened to get 5 of the colors because I was too slow to get all 6 and now I’m gonna have to wait to get the last one if it’s ever back in stock. The ones on the picture are Black Holo Witch (H), How Deep is your Holo (H), and the pink is “Menchie the cat” by Starrily for Simply Nailogical!